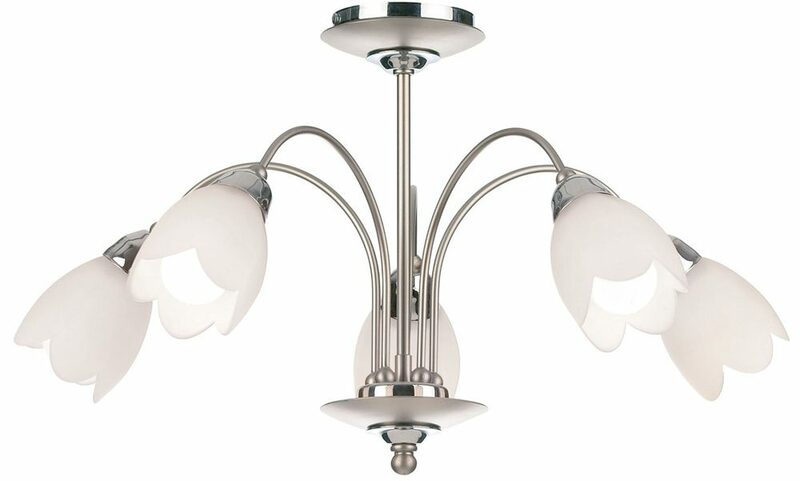 The Petal polished and satin chrome 5 light semi flush fitting is traditional, features matt opal glass petal shades and is perfect for any room with a low ceiling. Circular dual chrome ceiling mount and satin chrome drop rod, with five over-arching curved arms each with a polished chrome gallery supporting a matt opal glass petal shade for a softer light. The ceiling mount, lower finial and shade holders are all finished in polished chrome to create interest and contrast. A lovely compact semi-flush ceiling light design well suited to any traditional setting and a great lighting choice for any room with a low ceiling. There are matching light fittings in the dual chrome finish Petal lighting range, please see below.